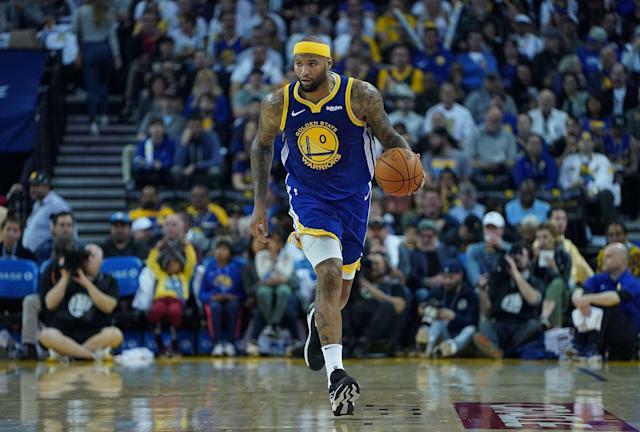 OAKLAND, Calif. — Golden State Warriors star DeMarcus Cousins is never one to shy away from tough topics and recently revealed to Yahoo Sports the worst obscenity fans have ever shouted at him during an NBA game. When asked which cities he heard racial slurs, the nine-year veteran and four-time All-Star declined to answer. However, league sources told Yahoo Sports one of the incidents occurred in Sacramento. When contacted for a comment, the NBA released the following statement: "While it would not be appropriate for us to address any specific conversations we have with individual players, we review all situations involving alleged fan misconduct. If we confirm the misconduct, appropriate measures are taken directly with the fan in question." It is unclear if racial slurs were involved in this incident, but Cousins mentioned it as an example of how players are routinely targeted and how the abusers often go unpunished. The conversation on the negative aspects of player-fan interaction was ignited recently when Westbrook reacted to some degrading comments made by a Utah Jazz fan in Salt Lake City. Westbrook was fined $25,000 for his part, and the Jazz banned the fan for life and issued the same penalty to another fan who was caught on video shouting, “Boy!” to the Oklahoma City Thunder star a year prior. Athletes have always dealt with nasty taunts, but Cousins said the way Westbrook’s ordeal was captured on video forced the situation to be discussed and addressed. “I think it kind of went viral with the whole Russ thing,” Cousins told Yahoo Sports. “I’m sure that played a part in it. He’s had multiple instances in that same city. You even got the one clip of the guy flipping Russ off. Like, when does the game get that serious for a fan? Why are you that angry? This dude is literally out there putting a ball through a hoop. How do you get that angry? Cousins made it clear he’s not against fans giving the opposing teams a tough time. He and other players just believe there should always be a level of respect that doesn’t veer into inappropriate territory.